Majority of the reviewers think that the shoe is one of the best Adidas basketball sneakers released in 2017. They highly recommend the product. Most users think that the traction is amazing. One comments that the grip is “insane” even on dirty floors. Due to the perfect balance of bounce at the heel and responsiveness at the forefoot, many testers commend the cushioning setup of this shoe. A lot of testers comment that the D Rose 8 has some of the lightest and most breathable materials ever used in Adidas basketball shoes, adding that the 8 is lighter than the previous model. Because of the Geofit technology, some players say that the ankle support of these high-top performance shoes is great. Some purchasers wear these Adidas D Rose shoes casually. According to reviews, the D Rose 8 is a shoe that is fit for all playing positions. Since most of the upper is overlaid with fuse, it will not be torn easily when playing according to a tester. One of the most complained about aspects of the D Rose 8 is its laces. Many say that the shoelaces keep getting undone, and it is a real pain since they need to re-tie them often. A couple of users also say that the laces are a few inches too short for double knotting. Some users notice that the laces can cause discomfort when tightened because of their shape. A wearer feels that Adidas could have come up with a better look for the shoe. For him, the D Rose 8 looks like a team model shoe and not a signature shoe of Derrick Rose. The shoe runs long by half a size. This sizing issue also apply with Kevin Durant’s 11th Nike sneakers. A reviewer shares his experience of getting blisters because of the stiff upper that digs into his skin. He warns that the shoe will need some time to break in. Under Armour’s 6th signature shoe with Stephen Curry has the same issue but in the tongue. 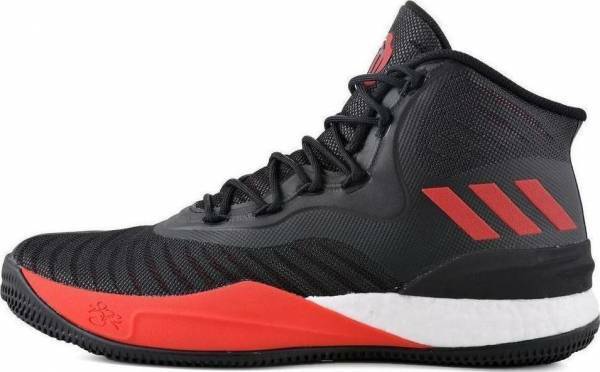 Many regard the Adidas D Rose 8 as a sleeper hit. Although it did not have much hype during its release, the shoe performs superbly on-court. Its cushioning maintains a balance of impact protection and responsiveness through its Boost foam. The traction is effective despite less than ideal court conditions. Lastly, the shoe’s fit and support are exceptional. The cherry on top is the breathability of the upper. As for the infamous laces, the wearer simply has to replace them in order to perfect Derrick Rose’s phenomenal shoe. Basketball sneakers that rise well above the ankle to keep sprints and jumps stable and well-supported. You sure can fly high when you have high-top basketball shoes to tie. Basketball sneakers that rise just up to where the ankles are. Providing support and flexibility so fine, mid-top basketball shoes surely hold the line. Basketball shoes that leave the ankles exposed for a better range of motion. Be flexible with your blows, get basketball shoes that are low. Some basketball shoes embody the athleticism and symbolize the life of certain on-court legends. Hooping will surely be fine when you get kicks from their signature lines. Hoop shoes that drop the traditional laces in favor of velcro straps for better efficiency. Secure strap basketball shoes, and have them in various hues. Basketball shoes that stick with the good old laces for that familiar security and lockdown. Get lace-up basketball shoes to tie because they never go out of style. Basketball shoes with uppers that provide a glove-like fit without the help of any lockdown mechanism. Do nothing but go in with slip-on basketball shoes . Some basketball shoes combine the powers of more than one lockdown styles for an improved fit and a much more stable ride. Get more bases covered with these basketball shoes. Basketball shoes usually weigh between 300g and 400g for speed and agility. Write your on-court tale with basketball shoes that barely tip the scales. Experts are basketball players, who post reviews at youtube, directly at RunRepeat or at their own websites. Each expert is categorized from level 1 to level 5 based on expertise. See stats on expert reviews and how we calculate scores here. If you guys wasnt a pair of very very good performance basketball shoes, then get the D Rose 8. Overall, it is a very nice shoe. I think this is the most versatile and well-rounded D Rose we got. Seriously, I think every single player could rock these and be impressed. Love them or hate them, the D Rose 8 is a true sleeper. Poor- looking from the outside but one hell of an impressive performer from the inside. Coming as the eighth iteration of Derrick Rose’s shoe, the D Rose 8 comes off as a surprise to some. The no nonsense shoe applies Boost on the midsole, foam-backed mesh on the upper, and Geofit technology on the shoe’s ankle collar. The shoe was worn by Derrick Rose on-court when he played as an opening-night starter in his first game as a newly minted Cleveland Cavaliers member. The athlete scored 14 points as the Cavaliers won against the Boston Celtics in a 102-99 battle. Cushion. The shoe’s Boost cushioning is identical to the previous D Rose model’s, only with some improvements to the foam’s responsiveness at the forefoot. This enhancement is made possible by the midsole cage on the lateral side of the shoe. Since the cushion does not have room to compress, it remains firm and springy. The uncaged heel compresses and spreads out when pressure is applied, providing an effective impact protection. Traction. The pattern for the D Rose 8’s traction looks like a coiled zipper. The rubber used on the outsole is both thick and hard, making the shoe a safe and durable option for outdoor balling. Length and Width. For majority of the wearers, the D Rose 8 runs long. It is advised that new buyers go half a size down. They are also advised to visit their local shoe stores to fit the shoe personally. Lockdown. The D Rose 8 employs the Adidas Geofit technology on its ankle collar. This construction involves placing foam in strategic areas around the ankle. After a few wears, the padding starts to conform to the shape of the wearer’s foot, complementing its anatomy and giving a one to one fit that does not leave room for slippage. An added lockdown feature is a lacing system that is held by a lace cord that runs along the edges of the tongue opening. Tightening the laces ensures that the upper is pulled towards the center of the of the foot, clasping it securely. The D Rose 8’s upper is made of foam with mesh overlays. Some colorways of the shoe use Jacquard knit instead of the foam-backed mesh material. In high-wear areas, the material is fused with TPU for additional rigidity and support. Die-cut slits can be found all over the upper for breathability and flexibility. The Geofit ankle collar is also heavily padded with foam to hug the foot’s ankle. The shoe’s midsole features Adidas’s Boost cushioning while the midsole cages are made of TPU. Not much can be said about the D Rose 8’s aesthetics as the shoe’s silhouette is consistent with the other Adidas D Rose models. The All-Star player’s signature is embossed on the lateral side of the forefoot while the D Rose logo is molded on the tongue. The Adidas logo is stamped just above the heel. Although Derrick Rose only stayed in the Big Apple for the 2016-2017 NBA season, Adidas is quick to honor his second team the New York Knicks with a Royal Blue and Orange colorway. Many fans also call this the “Cavs” colorway as the team used to sport a Blue and Orange uniform. The 2018 Chinese New Year ushered in the Year of the Dog. Adidas joined the celebration by releasing a special “Chinese New Year” collection that features the Adidas D Lillard 4, the Adidas Harden Vol. 1, and the Adidas D Rose 8. Derrick Rose’s basketball shoes come with a black knitted upper and Boost midsole. Its outsole is dark metallic blue with hits of pink.